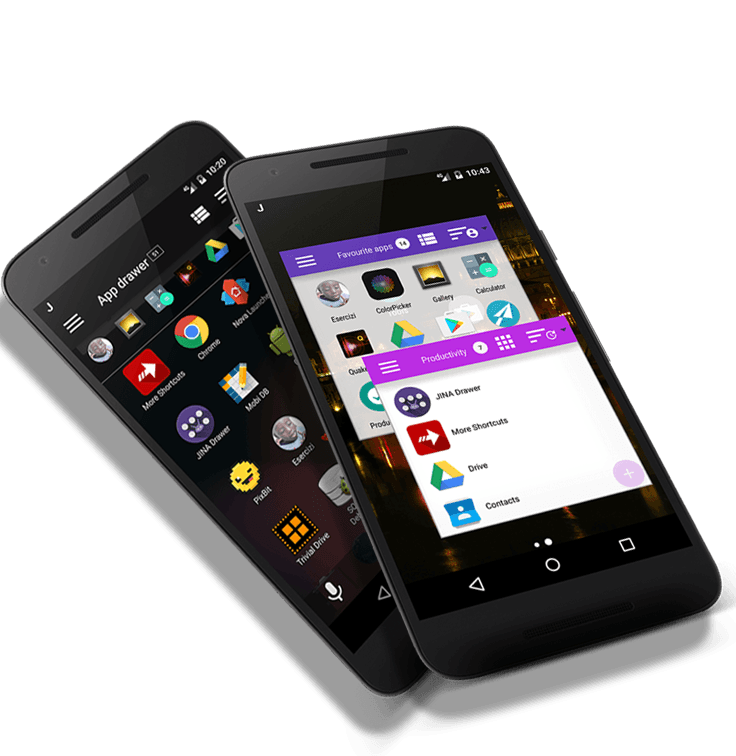 All of your apps and your folders at your fingertips, from anywhere! 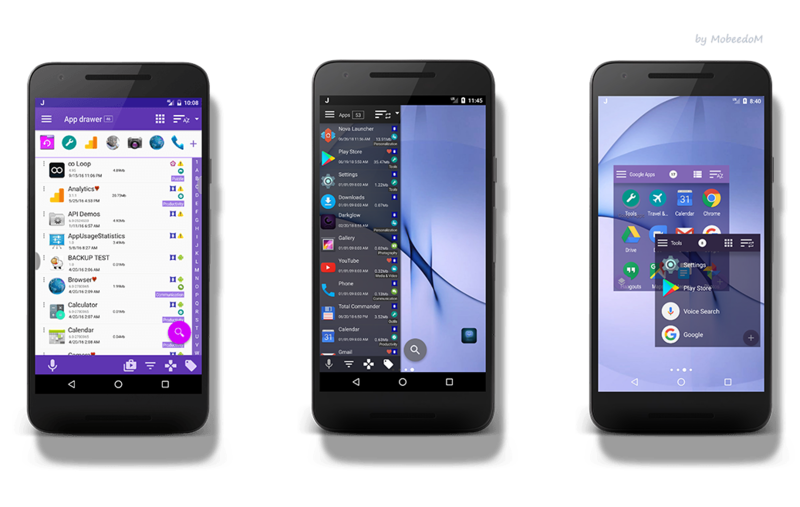 Organize your Apps and your Folders on top of your Launcher! 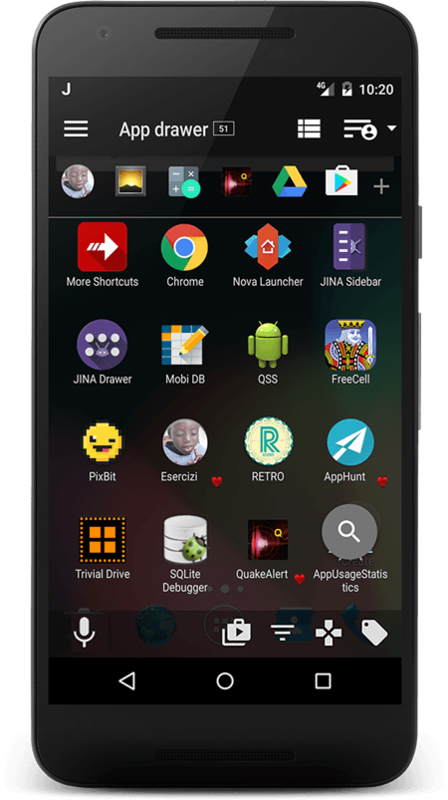 JINA is an App Drawer Replacement and an App Organizer bundled with a Sidebar always accessibile by a simple swipe on the screen. She is much more powerful and flexible than stock launcher's drawers. Since she works on top of any launcher, you can keep using Nova or your favorite one. 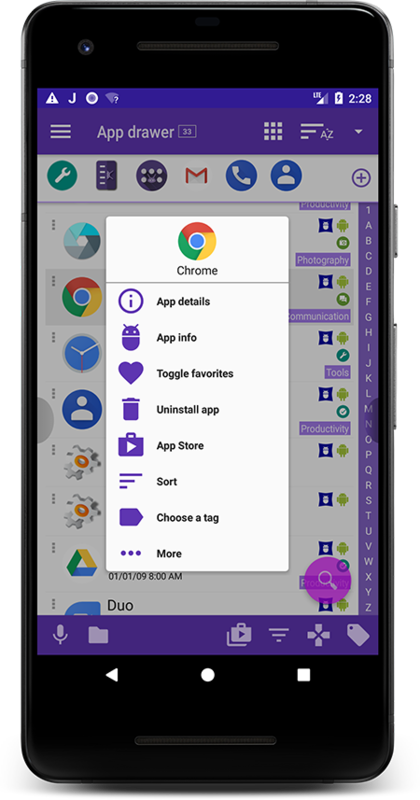 The App Drawer let you sort and organize your apps automatically by name, by size, by update or installation date, usage frequency and offers also the possibility to group apps by tags or to list them in a custom order chosen by you or to hide unwanted apps. The Sidebar acts as a side launcher that you can start from any app: multitasking and productivity are brought to the highest levels. A second Sidebar is available to keep your favorite apps and shortcuts handy. 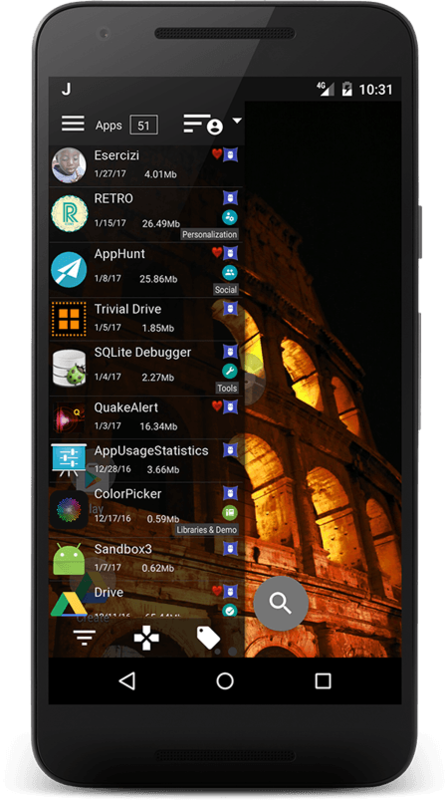 Several details screen are available to quick access every system functions you need (stop app, memory usage, store details, and so on) directly from the favorite sidebar or from the main side launcher. 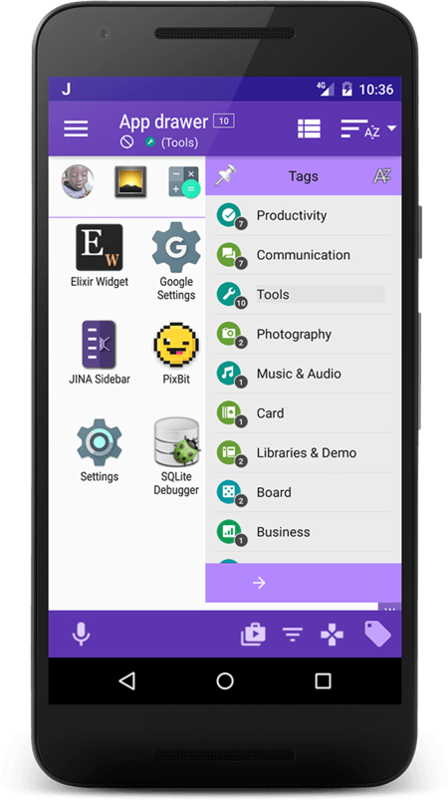 And it's not over, JINA is also a Smart App Organizer dedicated to search, manage and classify your apps, either automatically, by personal tags or playstore categories. 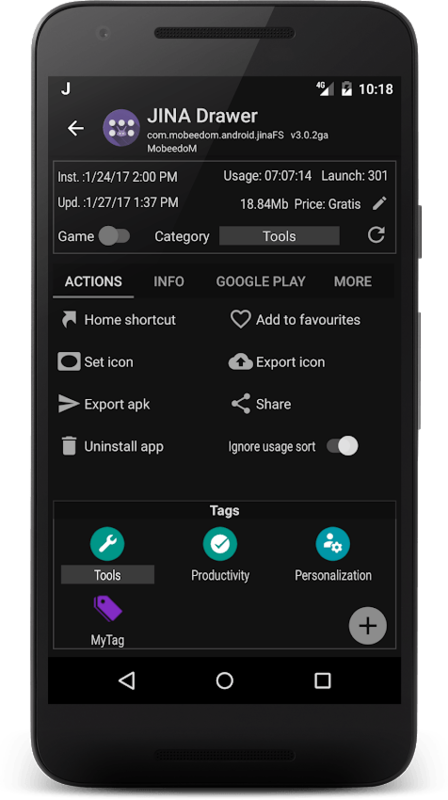 You can arrange your apps into folders and navigate within the drawer or the sidebars, or place them directly in the home as launcher folder widgets. No need to change your stock launcher, the advanced search features, also using a T9 keypad, in addition to the app organization abilities, will just make you forget the original start menu or app drawer. 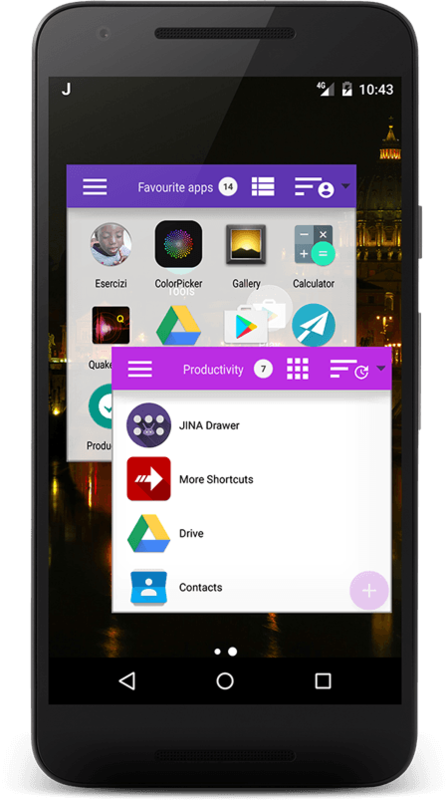 JINA can also be used to export apks and share apps with your friends, and there is much more: just try it to find out all she can do. Add your aliases to the app names to find them easily with a full text search. Keep the apps you use most frequently always at the top of the list. For better organization of apps, folders can be nested. Monitor playstore pages and changelog inside JINA. Keep your favorite apps always at the top of lists. You can easily hide unwanted apps or restore them whenever you want. 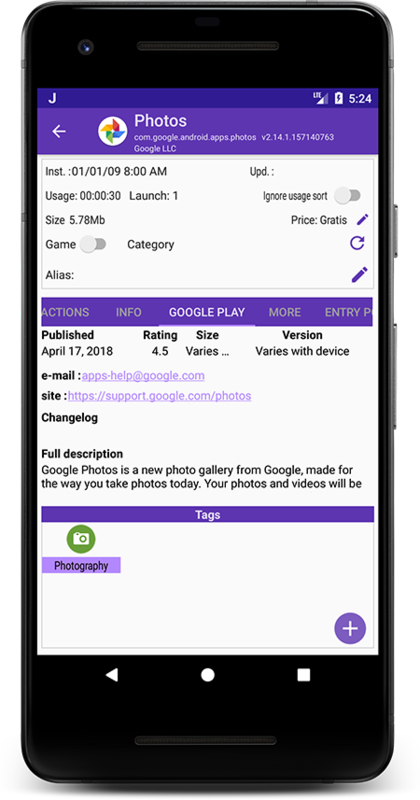 All the possible details about your apps, including a summary of the playstore page. Apply the icons from your favorite icon pack. Install nowto find out all that JINA can do! how to use the handler to resize and zoom the Sidebar. How to add an app to the Favorites Sidebar. how to manage and resize the Sidebar activation hotspots. how to use the favorites sidebar to show the system info screen of the current app. how to create a Folder and the home shortcut. how to add weblinks or files to a Folder.